Trooper Warren Allen was killed in an automobile accident when his squad car left a rain covered Illinois 17 East in Kankakee County and crashed into a large utility pole. The accident occurred shortly after 1:00 a.m., about one half mile west of Trooper Allen's home. State Police who investigated the accident said they are uncertain as to what happened. One theory offered is that Trooper Allen's eastbound car was forced off the highway by a westbound car that left the scene of the accident. One witness did come forward and said that seconds after Trooper Allen passed, going east, another car driving west passed. They then came onto the scene of the accident. 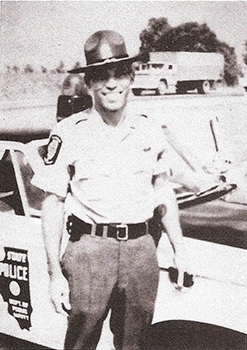 Trooper Warren Allen joined the Illinois State Police on June 27, 1959; He was assigned to District 6a, Ashkum. His wife, son and daughter survive. To fully appreciate the heroes of the present, we must recognize our heroes of the past. 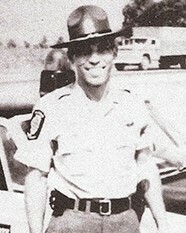 Your heroism and service is honored today, the 46th anniversary year of your death. I am privileged to be among the first to leave a tribute to you. Your memory lives and you continue to inspire. Thank you for your service. My cherished son Larry Lasater was a fellow police officer who was murdered in the line of duty on April 24, 2005 while serving as a Pittsburg, CA police officer.